The new simulators will debut at bauma 2019 between April 8 and 14 in Munich. John Deere has announced that it will be rolling out its new construction simulators to help workers gain a better understanding of their jobsite before they begin working. The modular update outfits the simulators to one of the following machine types: backhoe, crawler dozer, excavator, wheel loader, joystick-controlled motor grader and fingertip control motor grader. 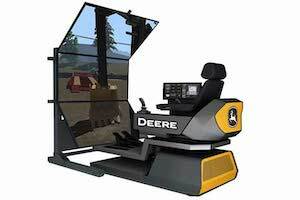 The simulators are all based on actual John Deere equipment, and users can now utilize swappable controls that allow for a quick interchange of joysticks and foot pedals. The software included in the simulators is highly detailed, and provides a realistic environment to cover both basic and advanced operator duties through various jobsite tasks. There is also a performance function included in the simulator, which measures user progress to help build proficiency. The new simulators will debut at bauma 2019 between April 8 and 14 in Munich. The backhoe, excavator, and motor grader simulators will be available this spring for customers to purchase, and the crawler dozer and wheel loader will be available this summer. To learn more, contact your local John Deere dealer.